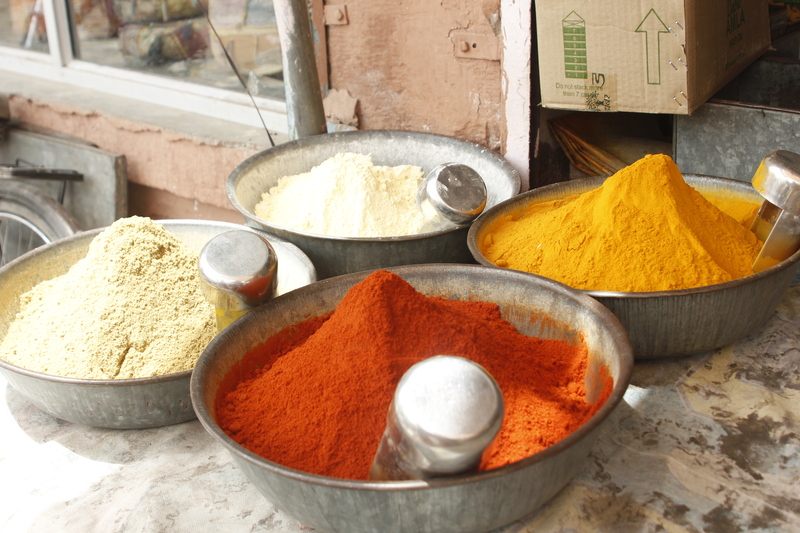 Recipe: Gutta Curry Rajasthan, Coming Soon. Today is my beautiful sister Talia’s birthday. I cannot believe that she is already 10 years old and that she is growing into such a beautiful young girl. I got to talk with here on the morning of her birthday before she went to school and feel a part of the celebration. Talia is one of the most talented and brightest girls that I know, and she loves to learn. Happy Birthday Talia in Hindi! 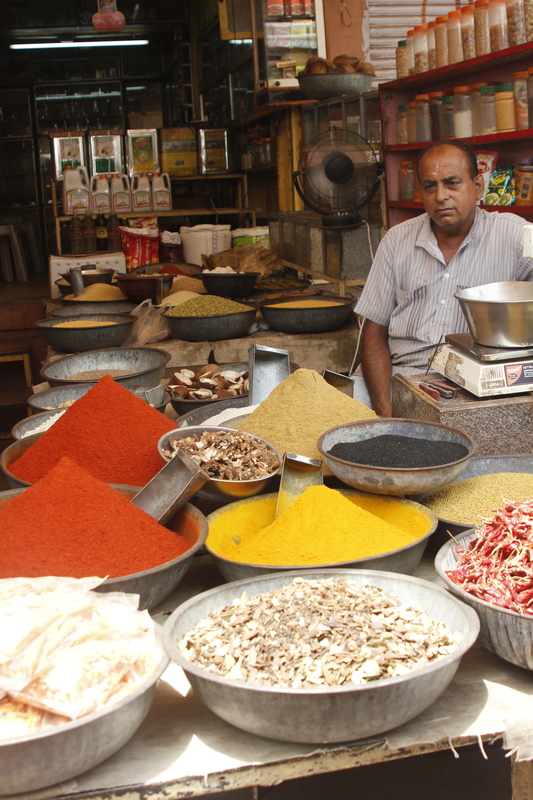 Food is nearly always a masala or curry with rice and/or bread, yet every region of India has a different flavor. Most vehicles here have only two or three wheels (motorcycles and three wheeled golf carts called autoricksaws). The stores are not stores like you think of. They have no doors, no windows, and no isles, and they are not clean. They are just little hole in the walls where you walk up to the counter and ask for whatever it is that you need. You bargain everywhere and for everything. People (including children) wander the street all day and all night. There are no garbage cans. People through their trash in piles on the street and when it becomes large enough, they burn it. I am going to keep adding to this list because one of my favorite things about traveling is discovering what the differences are between the places I have experienced. 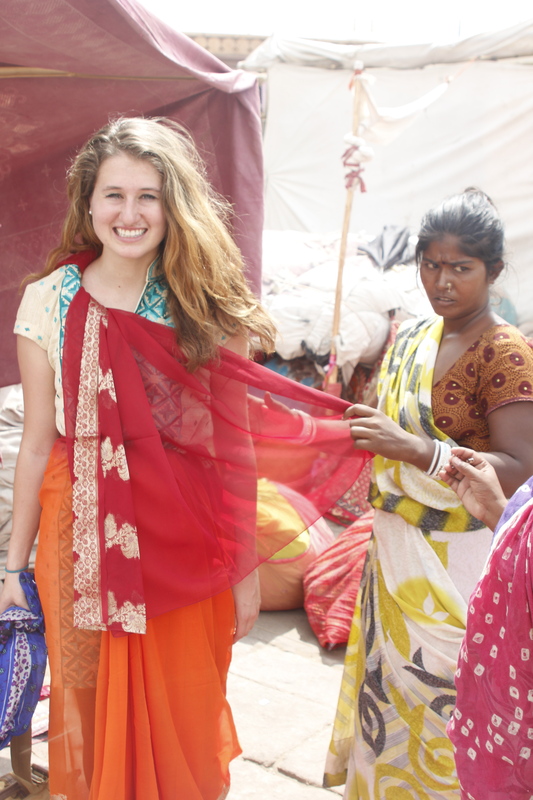 India is by far the most different of all the countries I have been to because there are so many people and so little resources to serve all the people. I see little children running around with no clothes, and men lying under anything that will offer them shade. The poverty here is almost too much to bear, and it makes me wonder over and over again what I can do to help. India is suffering in many ways. Many people are homeless, many families do not have enough to stay alive even in the most humblest of circumstances (even in the slums), good drainage systems and clean water is extremely hard to come by, children are not educated and many do not have parents around taking care of them, the women are treated as second class to the women (many are abused and denied privileges to attend school or work for money), and most the homes, buildings, and infrastructure is completely run down—there is too much to even grasp how bad it is. Do not get me wrong, India is a beautiful country, but beautiful is relative. Everything I mentioned above is true, yet the people go on with their day to day lives with a smile on their face. The landscapes, nature, temples, jungles, art, music, dress, and food is absolutely beautiful. 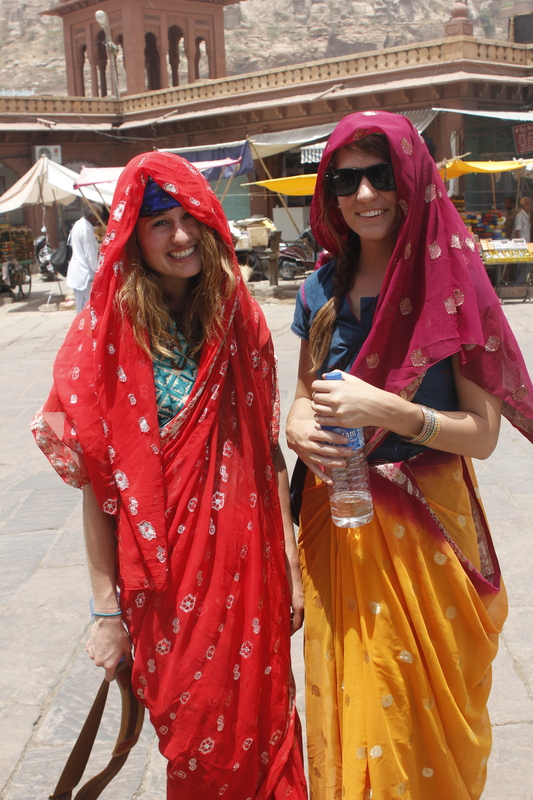 India was one of the most beautiful cultures I have ever experienced. The people here are incredible. I have dropped money in the street, left my camera batteries in my hotel, and forgotten to take one of my shopping bags from a store, only to have a nice young man hastily pick up my belonging and run it over to me as I am walking away in oblivion. Even in the most run down, impoverished country, people are good. As I look at how easy my life is living in a first world country, I wonder why these people were given the hardships that they have. It is hard to fathom just how many people do not have enough food to fill their little stomachs and clean water to keep them hydrated in the blistering sun. 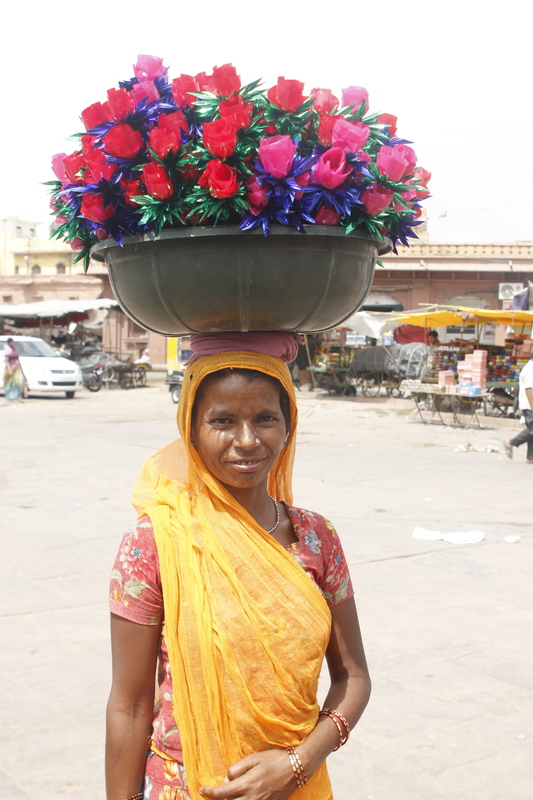 Jodhpur is by far the cleanest city we have visited. The blue houses look just I imagine Greece would look like. I figure that I need to go to Greece because both Portugal and India both look like what my mind imagines Greece to look like. 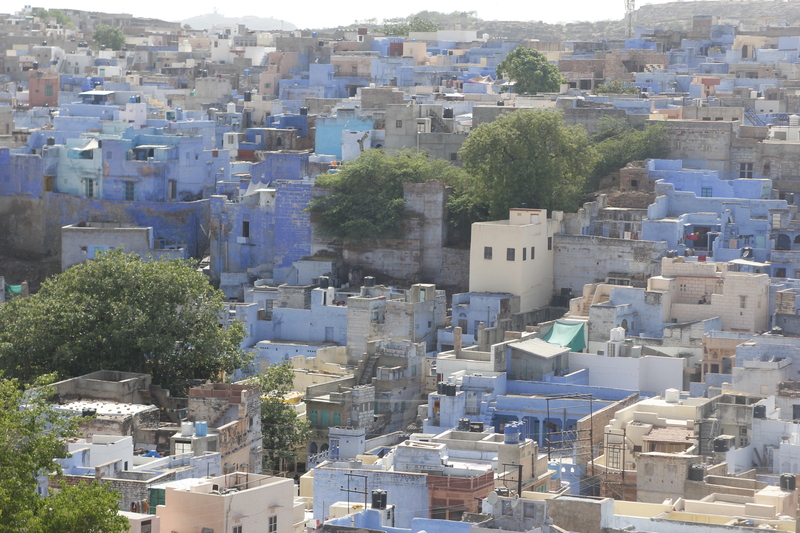 The water in Jodhpur has a blue tint, the street lights have a blue tint, and most of the houses are painted blue. One of the Gods in Hinduism is Brahmin, who takes on a blue form, and therefore the blue cubed houses of Jodhpur were built to honor him. The houses used to signify the home of a Brahmin (a follower of a specific sect of Hinduism), but now everyone follows the tradition. 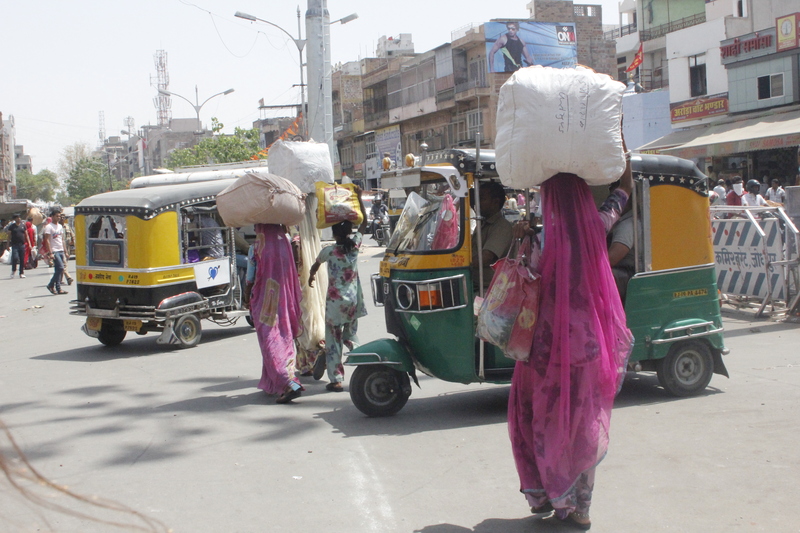 The city streets smell like a mixture of sewer, incense, and spicy samosas (a favorite Indian fried pastry). 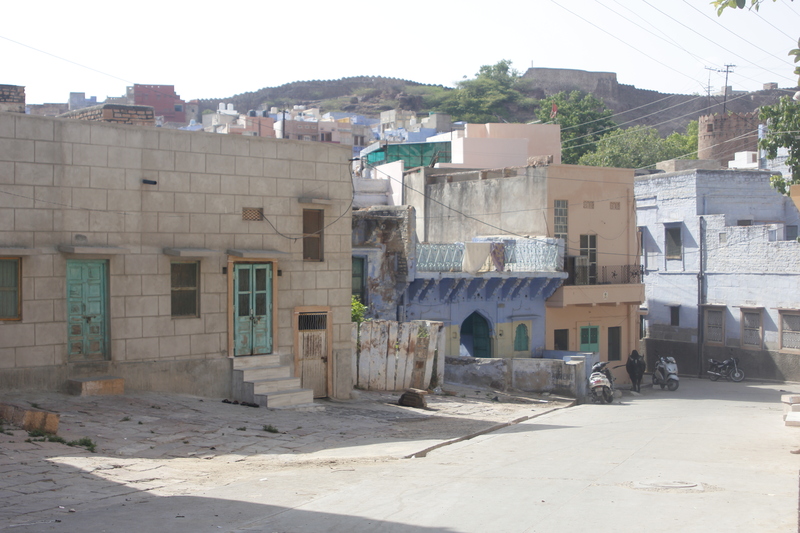 The blue houses and market streets surround a city fort that is built up on a huge rock overlooking the city. 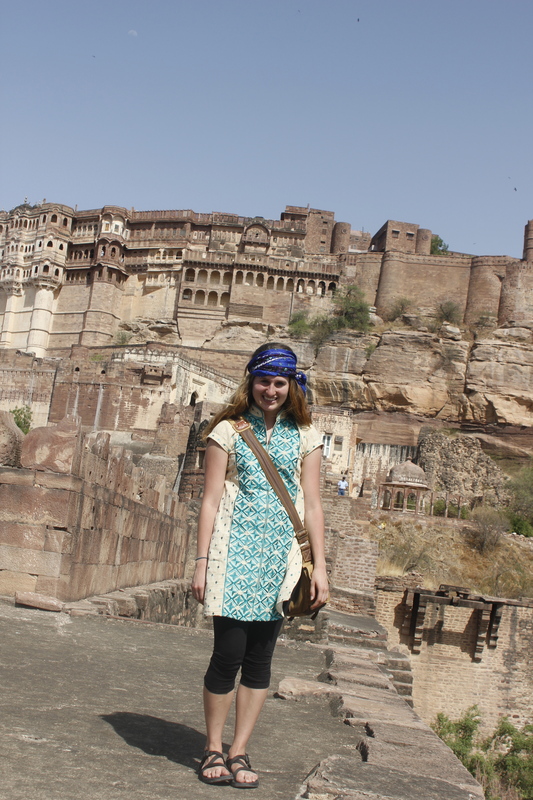 Rao Jodha built the fort, called Mighty Mehrangarh, in 1459. 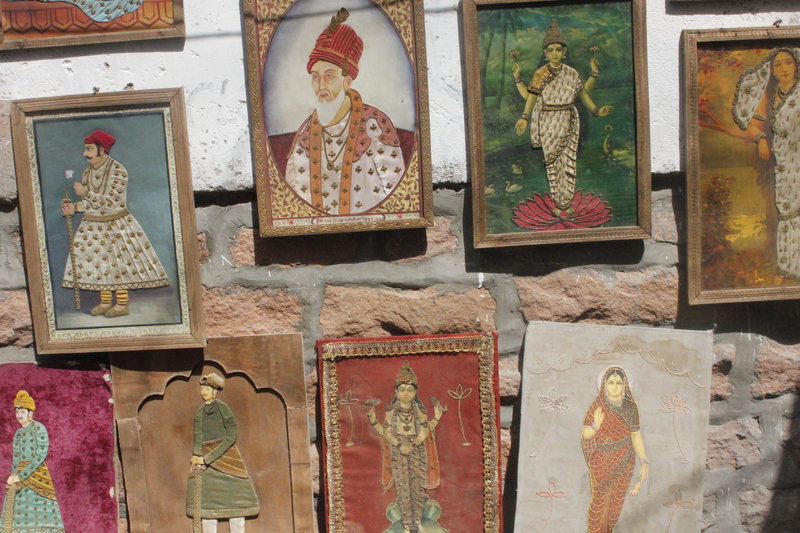 Jodhpur lied on the vital trade route between Delhi and Gujarat and still bustles alive with spice shops, textile manufacturers, carpenters, and Rajasthani food vendors cooking up delicious food on the roadside. 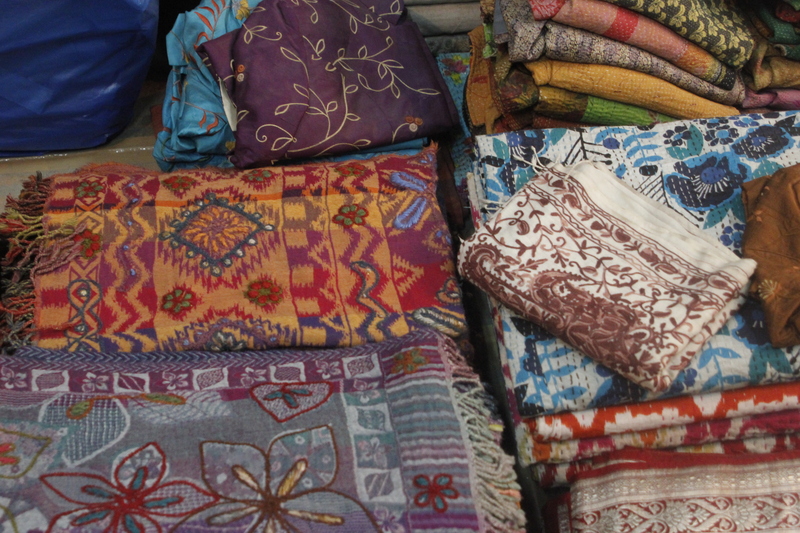 Our day was split amongst exploring the markets, blue city, fortress, and immersing ourselves in the heart of Indian textiles. 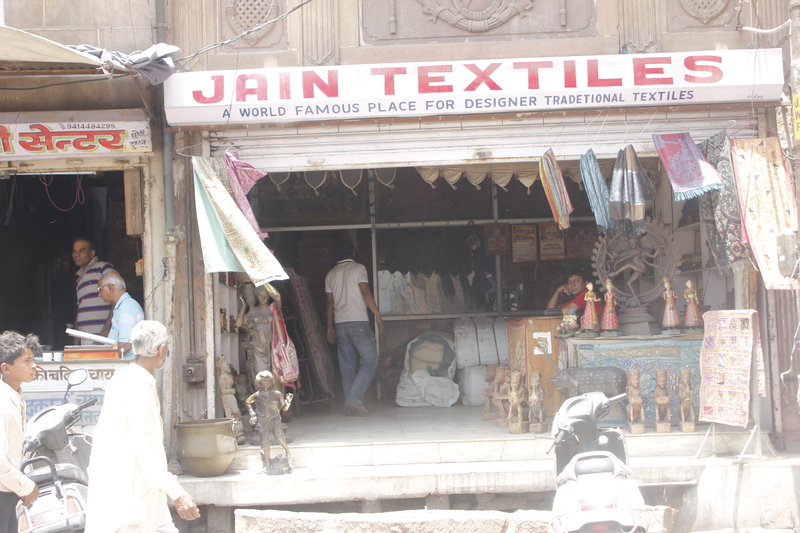 Just to the west of the giant clock tower that shadows above the bustling market streets, there is a hidden warehouse called Jain Textiles. 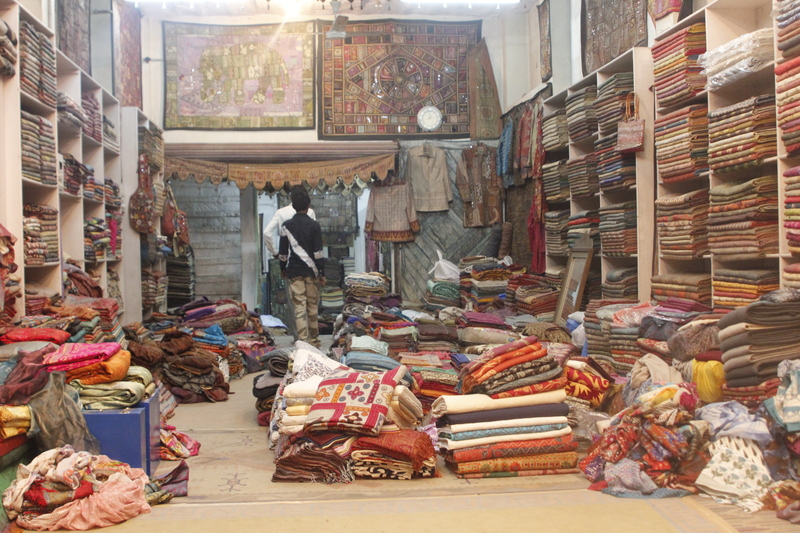 It is a five story building filled with ancient fabrics, pure silk swatches, and the best wool, cashmere, and pashmina blankets and scarves. Today was really the first day that we say other foreign travelers. We met up with a girl and a boy from England and a girl from Australia. 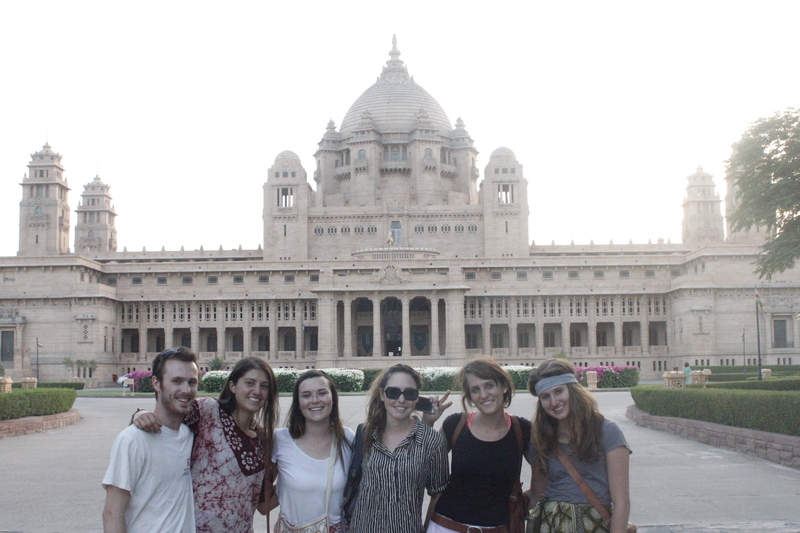 It was fun to be able to wander around the city with new company and learn their stories as to what brought them to India. 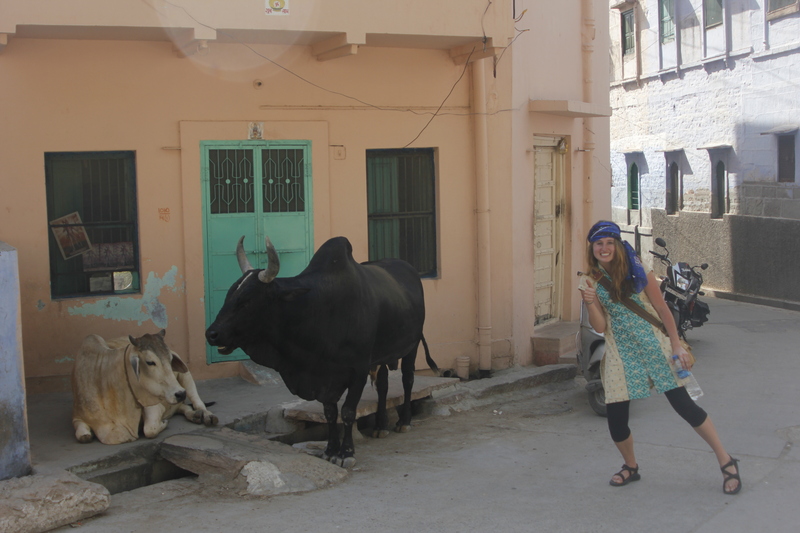 Claire is an Australian school teacher who took off a year to travel around the world. She started in Malaysia and has made her way to India and will end in Europe come the beginning of fall. The other two have been traveling separately, but have each been on the road for over one year. They started in the Americas and have made their way across Africa and into India to end in eastern Asia. It is so fun to meet people who have experienced so much of the world (although it makes me feel very much like a hippy to realize that I am becoming one of their kind).